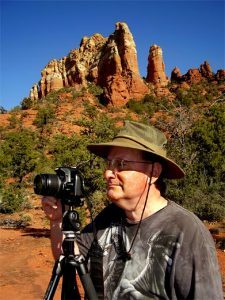 Jeff has been a published photographer and writer for over 40 years. His vast experience, attention to detail and professionalism has surpassed the needs, and wants, of his many clients. His first published photographs appeared in a magazine, along with an article he had written, when he was a freshman in college. From there, his clients grew to include additional publications, corporations, nonprofit organizations, advertising agencies, and stock photography. Since moving to Arizona, Jeff’s photography has focused on Fine Art and stock photographs. www.JeffColburn.com – A Fine Art and Stock Photography website. It also contains many useful articles for businesses and photographers. www.CreativeCauldron.com – The website for his many ebooks. These books will be of interest to photographers, writers, trivia buffs, and people looking for a unique children’s book. www.TheCreativesCorner.com – A blog for those who use, and create, photographs. There are many useful posts and tips for businesses and photographers. To see Jeff’s Fine Art photography prints in person, visit the New State Motor Building Gallery in Jerome, Arizona. It’s across the street from Grapes Restaurant, and down the stairs. These prints are perfect for decorating homes, offices and businesses. Nice photography blog, good collection. You have beautifully maintained. Hope u have a wonderful day. Awaiting for more new post. Keep Blogging!